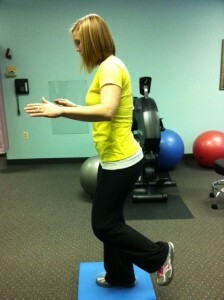 Balance exercises help to rehabilitate, restore, and prevent ankle and knee injuries. They work to increase the stability of the joints in the lower extremity. Balance training can also help to prevent falls in the elderly population. Balance training improves proprioception, which is the ability to know where your joints are in relation to one another. 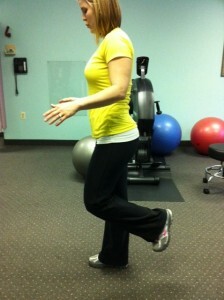 An example of a basic balance exercise is standing on one leg and trying to maintain the position for a certain period of time. To progress this exercise, it can be performed on an unsteady surface to increase the amount of strength/stability required for the exercise. If you have a chronic ankle or knee injury, you would benefit from physical therapy using balance training to improve the strength/stability of your joints. Frozen shoulder has an idiopathic gradual onset resulting in pain, stiffness, and decreased range of motion. Due to pain, the person tends to use the shoulder less. Frozen shoulder causes the shoulder joint to become inflamed resulting in thickening, scarring, and shrinkage of the joint capsule that surrounds the shoulder joint. Scar tissue and adhesions form around the shoulder joint resulting in chronic stiffness. Some reasons people may get a frozen shoulder are from having poor posture, prolonged immobility from a previous injury, diabetes, or disuse from pain. Research shows, frozen shoulder is often the first sign of undiagnosed diabetes. This is more commonly found in women over 50 years old. Diligent physical therapy is the key to recovering from a frozen shoulder. Rehabilitation from a frozen shoulder can take weeks to months, depending on the severity. Your therapist may apply heat and ultrasound to warm up the joint and instruct you in stretching/strengthening exercises to restore the range of motion and strength of your shoulder. Ice is often applied after exercises to reduce inflammation.